Moorpark Country Club Hole 1: The first tee shot of the day is fun as all the danger is evident. With hillside left and canyon right, the golfer better get it right early. The approach is no picnic either as the dogleg right golf hole stays real close to the canyon’s edge. Moorpark Country Club Hole 2 (left): This hole runs along the top of the ridge and is like they just cut a flat slice out of it as it is flat, but with 360 views of the Moorpark area. The hole itself is short and left is dead, as is long of the green. Right looks dead from the tee and fairway, but there is some room to miss there. Moorpark Country Club Hole 6 (below): This par three is long and requires a straight shot or one hit left-to right to best hit the angled green. The putting surface is relatively flat and will yield some make-able putts. Moorpark Country Club Hole 8: This solid, but short par fours calls for an accurate drive to set up the critical approach. This approach must carry the creek to a shallow, steeply sloped green, with not much room to miss on any side. Moorpark Country Club Hole 9: The closing golf hole to the Ridgeline nine requires a strong shot that carries the water, and also avoids it to the left. From anyplace but wet, the green is fairly negotiable. 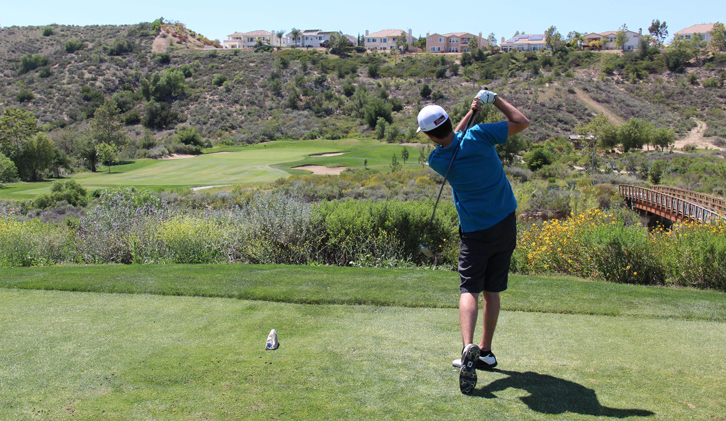 Moorpark Country Club Hole 12: This great dogleg left par four golf hole requires a solid drive as the player will want to have a short approach. The approach must carry a creek, on the other side of which borders a well-bunkered and strongly sloping green.